The cantaloupes at the farm only have a few more weeks of production so we’ve been eating them as often as we can. I love starting the morning off with our cantaloupe breakfast bowls but these lassi’s have definitely won our hearts over. If you aren’t familiar, a lassi is a traditional yogurt based drink from India. It’s usually a blend of yogurt, spices and sometimes fruit and sugar. 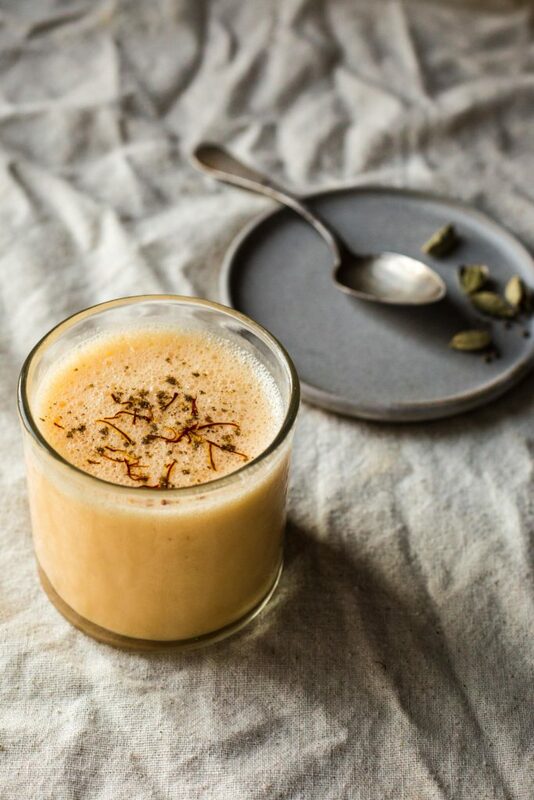 In the fall/winter I love whipping up our chai-spiced pumpkin lassi which is a perfect morning treat on a chilly day. However, it’s still August and this cantaloupe lassi is winning the breakfast game at Tumbleweed Farm. It’s sweet, spicy (thanks to the cardamom) and perfect farmers fuel for a hot day in the fields. And hey, you don’t have to be a farmer to enjoy this simple beverage. It calls for very few ingredients but the flavor is so spot on that we simply can’t get enough. And while I despise harvesting cantaloups (back breaking work is an understatement) I’ll happily sacrifice a sore back for a few more weeks of melon season. This my friends is what the summer bounty is all about! This drink can be whipped up in no time if you cut and freeze your cantaloupe the night before. Grab a straw and slurp up! Place all of the ingredients (minus the saffron and additional cardamom) in a high speed blender and whirl away until smooth and creamy. Taste for seasonings and adjust as needed. Pour into glasses and garnish with saffron threads and additional cardamom. This is perfection! I’ve been all about smoothies for breakfast lately and definitely need to add a lassi to the mix! I haven’t consumed nearly enough cantaloupe this season, so this is perfect for catching me up! I am not eating dairy at the moment, do you think this would work with full-fat coconut milk? Thanks! Sounds so good! We got cantaloupe in our CSA this week and I’ve been wondering what to do with it. This sounds right up our alley, thank you!